Twee dagen lang kan je genieten van een, voor het Europese vasteland, unieke verzameling ‘warbirds’. Het betreft hier militaire vliegtuigen uit de tweede Wereldoorlog die, in hun meest originele staat, verschillende demonstraties verzorgen. 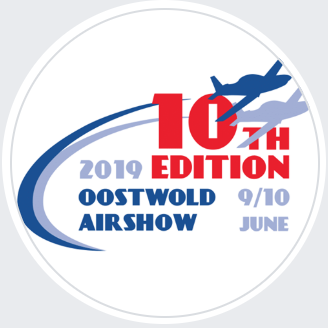 Onder het motto ‘Time Flies’ kan je op 9 en 10 juni 2019 genieten van duizelingwekkende stunts, schitterende formaties, bijzondere voorbeelden van vliegend Nederlands erfgoed en opvallende hedendaagse aerobatics vliegtuigen. Voor het laatste nieuws, click op boven staande logo. Het vliegprogramma, de static display en alle randactiviteiten, waaronder de airmarket en de medewerking van ruim zeventig re-enactors, vormen een perfecte combinatie voor jong en oud. De 10e editie van de Oostwold Airshow belooft weer een bijzonder evenement op – letterlijk en figuurlijk – hoog niveau te worden. From Monday 1 April to Friday 12 April, Leeuwarden Air Base will host the large-scale international exercise Frisian Flag 2019. During the exercise, over 50 aircraft and fighter aircraft will complete extensive and complex training missions. 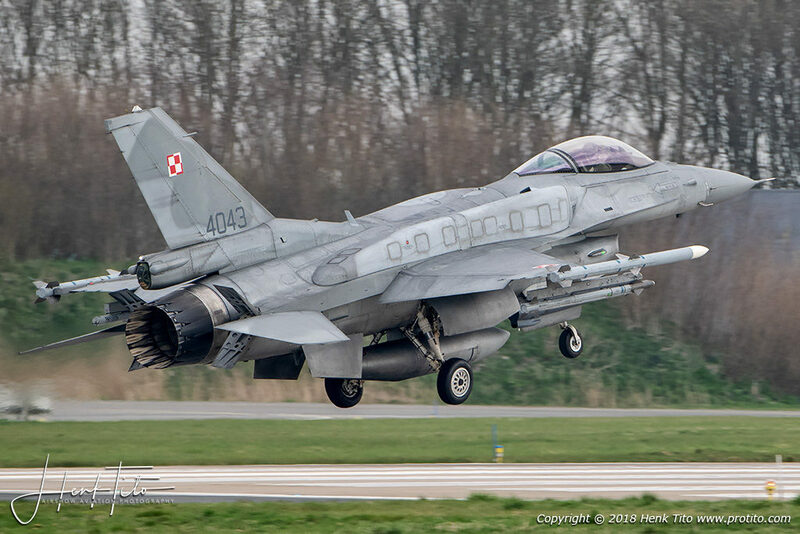 In addition to the Royal Netherlands Air Force’s F-16s, coalition partners Germany, France, Poland, Switzerland, United Kingdom and the United States will also be participating in Frisian Flag with their (fighter) aircraft. Exercise Frisian Flag will take place twice a day between 08:00 and 16:00. There will be no flights at night and during the weekend. The Dutch and German Control and Reporting Centre (CRC) will have command over the entire exercise area. An AWACS radar aircraft will support the CRC with radar images and its onboard tactical controllers. Frisian Flag is organised by 322 TACTES Squadron, based at Leeuwarden Air Base. 10 and 11 October 2018 the annual Swiss Air Force live fire event will take place at the Axalp–Ebenfluh air force shooting range, in the canton of Bern. The training will be held on 09 October 2018. We know from experience that the event attracts many visitors. We recommend using public transport for the journey to Brienz. The spectator areas are situated at an altitude of 2,200 m above sea level. Warm clothes, waterproofs and good shoes are indispensable. 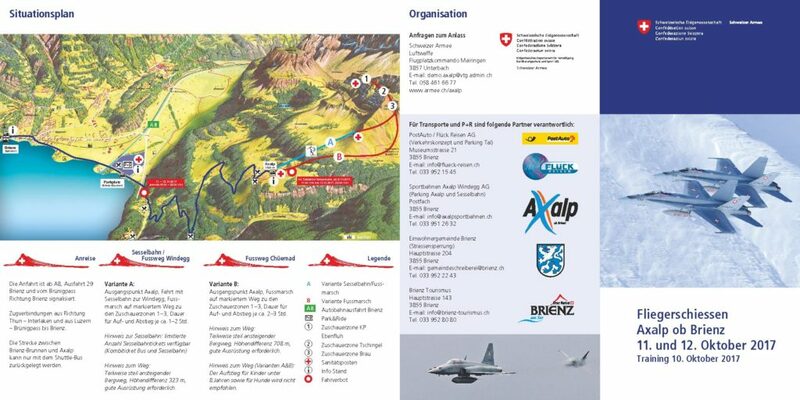 The spectator areas can only be reached from Axalp/Windegg on foot by taking marked mountain paths. Visitors should wear suitable gear and be in good physical condition. The route is not recommended for children under the age of eight or for dogs, and spectators hike up to or descend from the air force firing range at their own risk. The instructions of the safety officials must be followed at all times. Rescue and medical services will be available (see map). Help can be requested from the organisation managing security. The performances start at 2pm sharp. Access paths to the Ebenfluh and Tschingel spectator areas will be closed after 1.30pm. The air force live fire event lasts for approx. 1 1/2 hours. The entire area of the air force shooting range has been publicly designated a hazardous zone. On no account may cordoned off areas be entered. During the air force live fire event, all spectators must remain within the marked and cordoned off safety zones. A commentary on the air performances will be given in all spectator areas via a public address system. There are toilet facilities in all spectator areas.